Such is logic when it comes to obtaining a German Drivers License - especially with a Motorcycle Endorsement. I may have mentioned earlier that there is a nice little "logical" agreement between many of the States in America and Germany, where your American drivers license is exchanged for a German drivers license with no need to take a written or driving test - just pay the fee. So happens that my PA drivers License is honored in the exchange agreement. This makes one of the necessities when moving to Germany very easy. Oh yeah - hold on! Not so if you also need a Motorcycle Endorsement. For some reason the Führerscheinamt (Department of Motor Vehicles) has it in their "logic" that it's OK to just give an American a German drivers license (provided you pay the fee) for an automobile with no written or driving tests required. Mind you the driving laws and road signs are not insignificantly different here, but never mind that. But, if you also want the Motorcycle Endorsement on your American drivers license to be transferred to your German drivers license - "Forgedaboudit" (this is not German, it's New Jersey-ese). TÜV administers the tests for all of Germany. In order to be eligible to take the tests a Fahrschule (driving school) must recommend that you are ready to take the test. This means that you need to sign up with a Fahrschule. Fortunately, Judith knows some very nice people at Peppel's Fahrschule. They organized everything and I was able to study the German regulations on line, which a good thing because there is no little Driving Test Study Book like in America. But, the regulations are pretty different and there is a lot of them and they are really bizarre. For example, can you figure this question out? You want to turn out of a road with a sunken kerbstone into another road. A car is coming from the left. 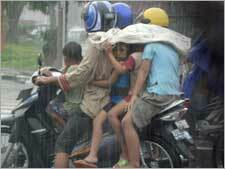 What applies here? After taking about 175 (no kidding) practice tests on line I felt I was ready to go to TUV and take the test. The big day was this past Monday. The test is given by a computer program. 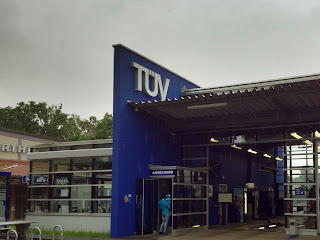 So promptly at 10:45 on a gray and rainy Monday morning myself and about ten others gathered at TÜV for the test. 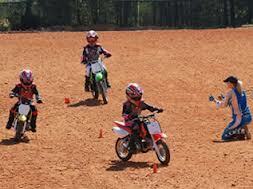 Most everyone was taking the normal driving test - not the motorcycle test. I was of course the only American. I did get to take the test in English at least. Twenty minutes later I was finished and even though I know the answer to the "Sunken Kurbstones" question they didn't ask. BTW, the correct answer is number 1. I did however Ace the test!!! Now... the riding test is next. Weave through little orange cones, go in circles, panic brake, blah, blah blah. But the catch is there is also an on road test after the little orange cone test. The test is in about two weeks - wish me luck!